At Lawyer Legion we recognize the importance of board certification programs in taxation law. These programs provide a powerful tool when the public begins their search for a tax law attorney in California. 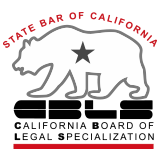 The State Bar of California Board of Legal Specialization certifies attorneys as specialist in taxation law. Only California attorneys board certified in taxation law can advertise or identify themselves as "certified specialists" or "board certified" in California for that field. The Rules Governing the State Bar of California Program for Certifying Legal Specialists govern the program requirements and should be read in conjunction with the standards for certification in Taxation Law. Among other requirements, the attorneys must pass the legal specialist examination, demonstrate substantial involvement, and complete continuing education requirements. Attorneys who are certified in Taxation Law in California must apply for re-certification every five years after the initial certification date. For purposes of California's board certification program the term "taxation law" is defined to include the field of law involving the Internal Revenue (IRS) Code and other local, state and federal tax statutes and interpretive material in connection with matters in which issues of taxation are significant. Estate and Gift Tax and Estate Planning (defined as California and Federal tax law relating to disposition of property including estate planning). participation in tax litigation proceedings at any level, including appearances before the Appeals division of the IRS or any local or state tax agency or revenue authority. In order for the attorney to obtain certification in taxation law, the attorney must show that he or she has completed not less than 45 hours of educational activities specifically approved for taxation law. Additionally, credit may be given for an LL.M. degree in taxation law from a law school accredited by the American Bar Association or an equivalent degree. The search for a good tax attorney can be a daunting task. At Lawyer Legion we make that task easier by properly recognizing board certified attorneys in our online directory. This article was last updated on Saturday, October 18, 2014. Lawyer Legion is on online attorney directory and independent media resource not affiliated with or endorsed by any state bar or other legal association. Although our "find a lawyer" directory recognizes attorneys authorized to practice law in each state and attorneys who are board certified by state and national certification programs, Lawyer Legion is not affiliated with any associations or specialty certification programs. The logo for these organizations is displayed simply as a visual indicator to help users identify the organization. Lawyer Legion is not a lawyer referral service. Information about individual attorneys does not represent any form of endorsement by Lawyer Legion or any other organization and does not imply any level of special competence. The content published on this site is for informational purposes only. The information you access through this site is not legal advice. No attorney-client relationship is formed by use of this site. Your access and use of this site is subject to additional Terms and Conditions.